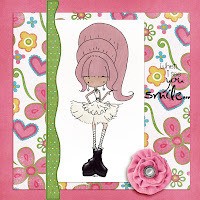 super cute card Mary, I so love the way you digi colour, her boots look awesome!! swoon.. love that pop of green you have here on the card.. your card is so sweet! So happy you joined us at Tiddly Inks this challenge!! Ooh, great image. Love the papers on this one too. It is a very sweet CAS card and perfect for the challenge. Thanks for joining us at Tiddly Inks!